Crown Flora opened just over two months ago in Parkdale . It's instantly noticeable for its somewhat at-odds double window display--on one side, a carpet of moss is speckled with terrariums, while on the other, elegant and minimal handbags share space with simple arrangements of purple hyacinths. This dichotomy is part of what makes Crown Flora instantly charming. 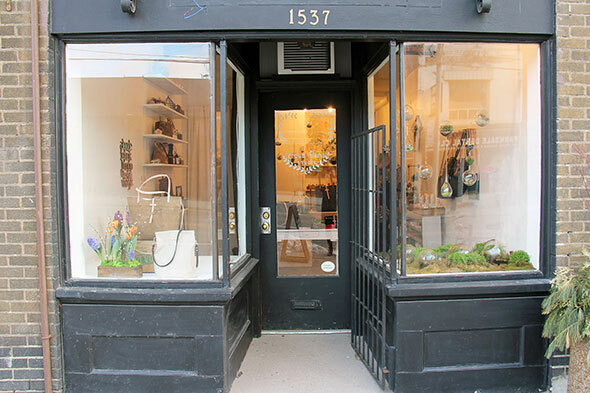 Crown Flora is the storefront of a brand that combines fashion, printing, and terrariums, and originated at craft shows and pop-up shops, before making its way to Etsy, and finally to Parkdale. 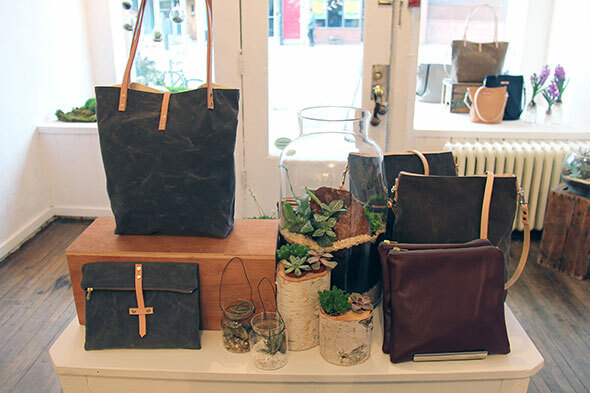 Owners and partners Adam Mallory and Davis Knounnoraj have set up a retail-work space, with wares displayed in the front, while bags and terrariums are made on-site in the open studio in the back. 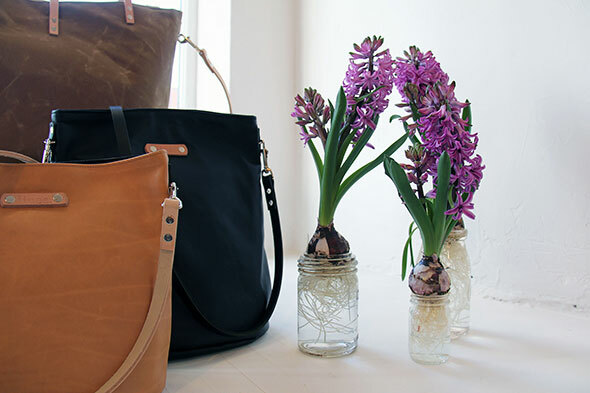 Mallory is a florist by trade, and has been creating terrariums for about two years, while Khounnoraj has been creating bags for about 10 years. Mallory describes his need to bring some sense of nature into the city; he grew up in rural Ontario, surrounded by gardeners. He shows me some examples of event and bridal bouquets he's created in the past, and they're woodsy and controlled, with careful splashes of colour. He's previously worked at Fairmont Hotels out west, where he fine-tuned his aesthetic. 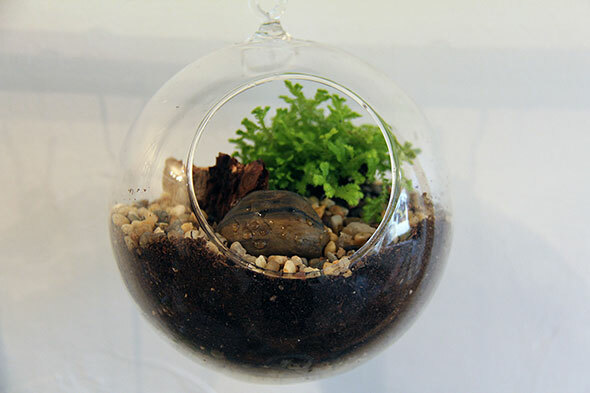 His terrariums are available in a range of sizes, from precious and twee ($15), to mid-sized ($30-$55), to imposing pieces ($95) that would take up a fair bit of real estate on a coffee table. 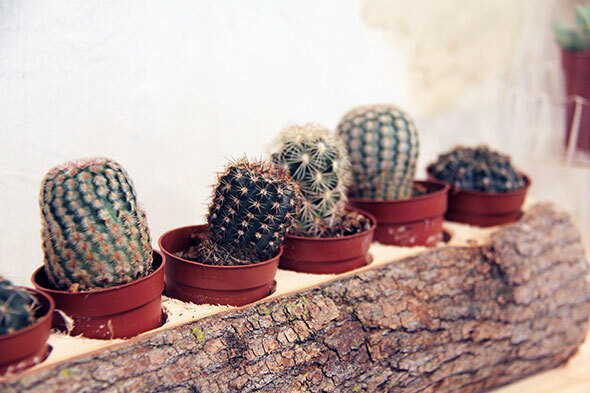 He tells me that they've been a hit with men (especially at Valentine's; ladies take note), and one glace at the rustic miniature cacti set into a tree stump, and it's not hard to see why. 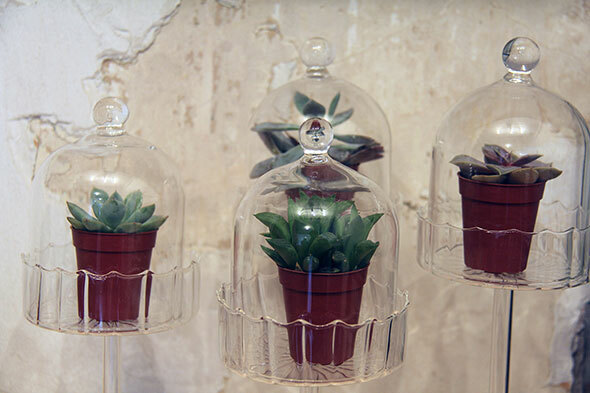 Especially lovely are a series of air plants set within delicate bell jars, mason jar terrariums, and the array of hanging terrariums that create a truly magical atmosphere. Perfect for those without green thumbs, these plants will thrive under the most minimal of care, and while some will yield the occasional bloom, most are stunning as they are--set on beds of pebbles, moss, or pieces of bark. Mallory's even working with a glass artist from Harbourfront Centre to create one-of-a-kind glass vessels. You can find Mallory's terrariums at spots around the city like Scout , Far Away Eyes , Kid Icarus , and Bookhou (which is owned by Khounnoraj's sister). 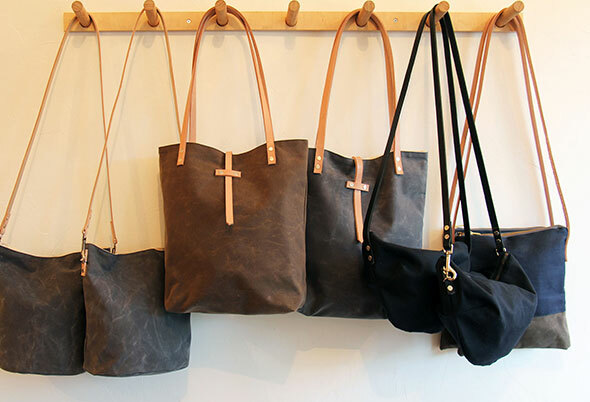 Meanwhile, Khounnoraj's handmade bags are simple, streamlined, and well-priced. 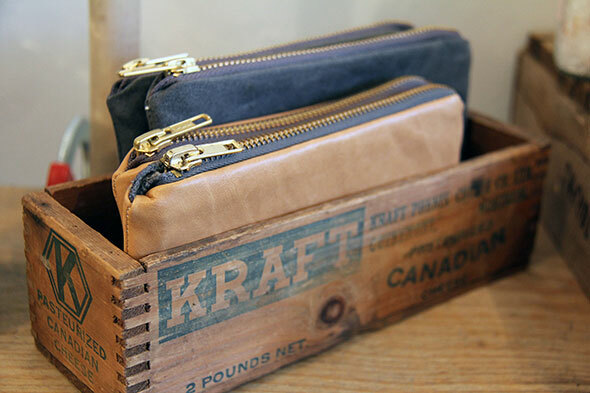 The thrust of his stock is constructed from waxed canvas, with naturally-finished leather detailing ($45 for smaller bags, $75 for mid-sized), although he also has several leather bags ($175). You'll also find small pouches, toiletry kits for men, wallets, as well as Khounnoraj's signature prints: the stark black-and-white face of a cat that's become his signature at craft shows, which is printed on pillows ($25), tea towels ($16), and both kid-sized ($12) and adult T-shirts, and Crown Flora's logo. His most popular item retails for $125, and is a fit-all tote with a detachable messenger strap, that comes in an impossibly chic desert tone. The aesthetic will translate nicely to the unisex backpacks they're planning for spring. 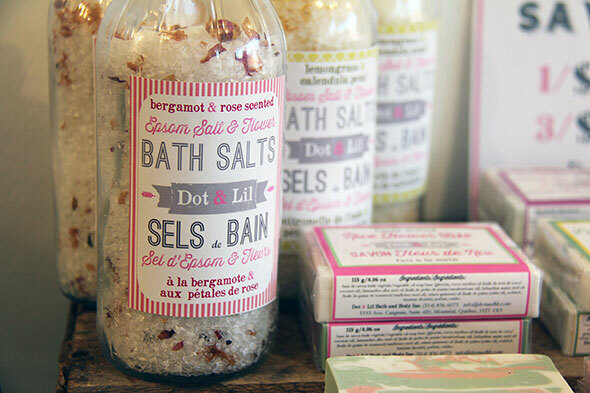 Their only line of cosmetics is Montreal's Dot & Lil (including aftershave, $16), which Mallory tells me is all-natural, and uses powerful, evocative one-note scents. A collaboration with Dot and Lil is in the works, with Crown Flora candles, pump soap, and gardener's hand cream, and Mallory tells me he plans for it to be organic, and slightly more woodsy in scent. The shop doesn't do one-off arrangements, although flowers are in the shop for Valentine's Day, Mother's Day, and all other florist holy days. "We've been booking a lot of weddings," Mallory says, "and brides are choosing terrariums as centerpieces." The cost is a bit higher (beginning around $100), but the look is undeniably unique and they double nicely as lasting favors. 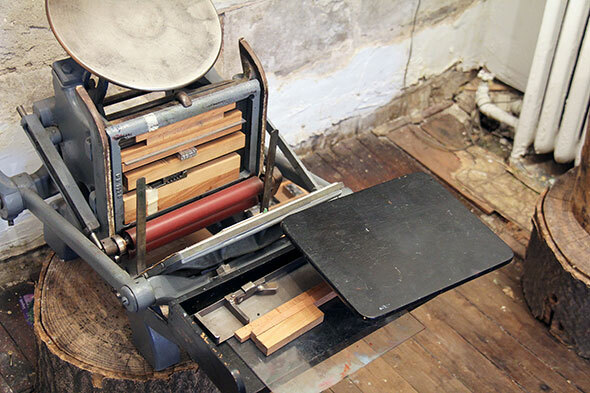 A 100-year-old refurbished letterpress machine sits in the back, and is used for Crown Flora's custom invitations (with a line of stationary in the works), as well as paper goods (placeholders, invitations, and the whole shebang) for weddings. Mallory tells me that they're planning letterpress and terrarium-making workshops for the near future (available separately or as a combo), and that it's actually more economical to learn the basics of the letterpress, then rent it out (at around $100/hr) and do the dirty work yourself. Their passion for their work is infectious, and perhaps most indicative of this is Mallory's insistence that the only thing that would change if he won the lottery would be that they'd buy the whole building in which the shop resides. Now that's love.